These are exciting days in Pittsburgh! 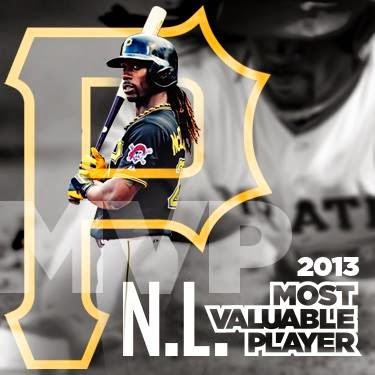 The Pittsburgh Pirates took home a couple of pretty big awards this week. First it was the 2013 National League Manager of the Year: Clint Hurdle, the Pirates' manager, was the winner! Then, today, it was the 2013 National League Most Valuable Player: Andrew McCutchen, the Pirates' all-star center fielder, won it! This is really big news! What a great accomplishment for the Pirates, who not only broke a major American sports record 20-year losing streak, but also qualified for the playoffs and won a playoff series in the first round of the playoffs. 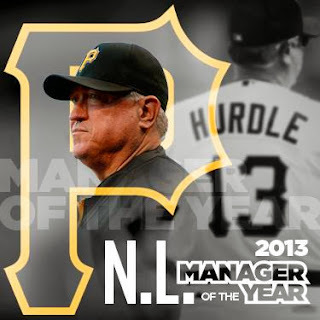 Congrats to the Pirates, to Clint Hurdle, and to Andrew McCutchen!